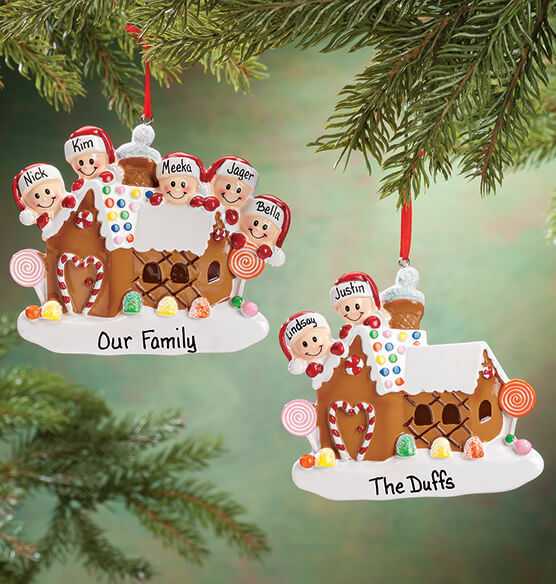 Celebrating life's best treats, this Personalized Gingerbread Family Ornament will be specially made for your own sweet family! Decked with glittery gum drops, bright lollipops and peppermint candy, the frosted house is a holiday dandy—complete with a sparkling ice-cream cone chimney and red hanging ribbon. We'll add 2, 3, 4, 5 or 6 names to each resident's Santa hat, plus family name in the marshmallow snowbank. Specify first names; limit 1 line per Santa hat, 8 letters/spaces each. Specify family name; limit 1 line, 15 letters/spaces. Resin. Personalized Family of 4 , Plain Family of 4 are not available at this time. This is a delightful ornament for my grand-daughter's family this Christmas. I ordered several of these ornaments for family members, and all were nicely decorated. Very pleased! Great ornament. Very pretty & I was also able to add the year on the roof of the gingerbread house. I order ornaments every year for my grandsons. The little gingerbread house is so colorful and cute. 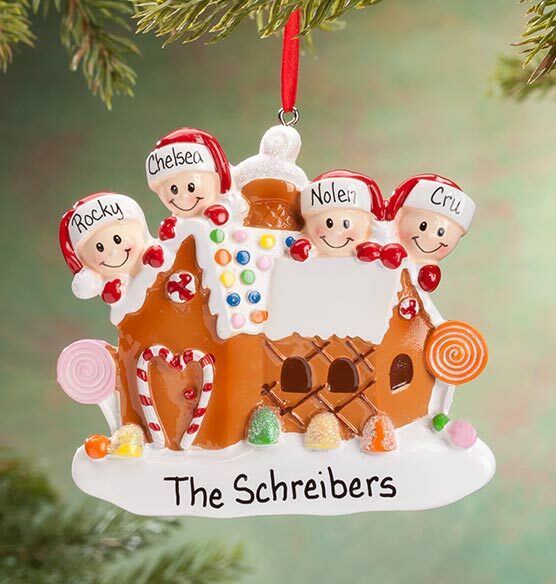 I purchased this for my granddaughter and her family (I used with a discount and free shipping), it is absolutely adorable, seems well made, all the names were correct, received in a fairly timely manner as I needed to gift wrap and get in the mail for Christmas. 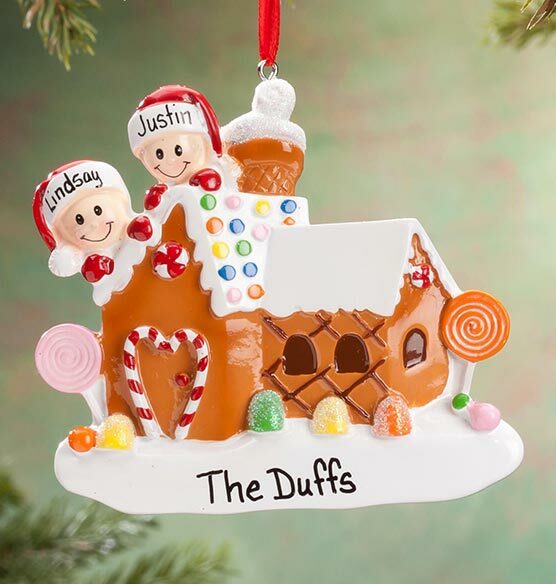 Compared to other personalized gift sites this was a deal and I may use Miles Kimball again next year for ornament. Bought these for our kids and families for Christmas. They're so perfect. The colors are bright and great detail! I always go to Miles Kimball for my personalized family ornaments! Each year I check out what is available other places but always end up at MK. The variety and accuracy never fails! I like the whimsy of the elves. 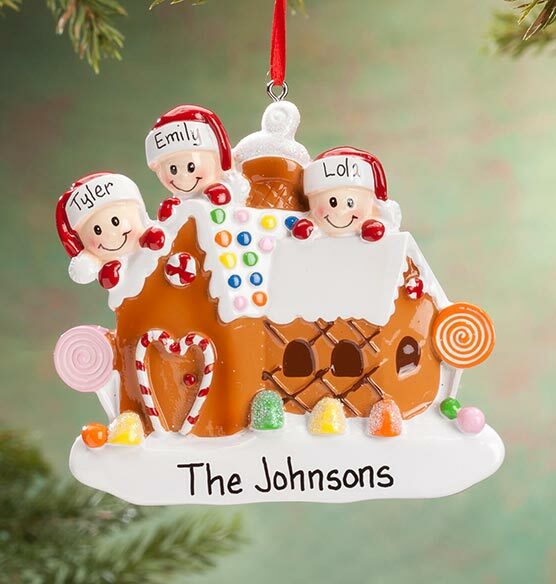 I thought these ornaments are adorable and I like that they can be personalized. And all for a great price. Thank you!!! We have a new baby and I wanted to buy our first family Christmas Ornament. I do an annual ornament exchange with friends and I thought this ornament was very cute and something that my friend would really enjoy. I get my oldest kids an ornament every year. good variety; couldn't get other website I visited to work. my son just got married so i thought it would be cute to add my new daughter-in-law to a family Christmas ornament..
Can you add a dog to a family ornaments? BEST ANSWER: Thank you for your question. Unfortunately no we are not able to do that. We hope this information will be of help to you. can date be added ? BEST ANSWER: Thank you for your question. Unfortunately no there will not be enough room for that. We hope this information will be of help to you.